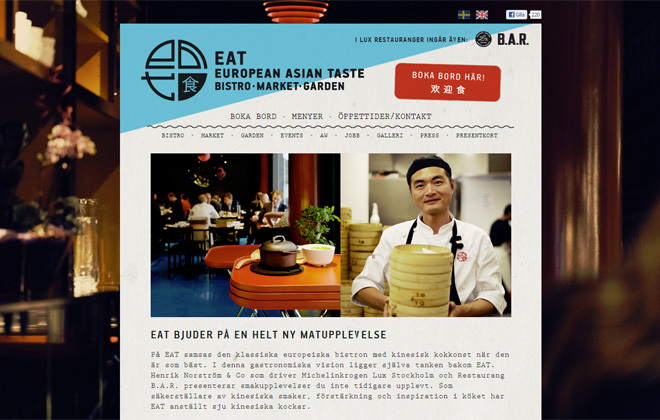 EAT, as in European Asian Taste is a restaurant constituting of three different sections; EAT Bistro, EAT Market, and the Chinese biergarten EAT Garden. Idea and design by Bror Rudi Creative and development done by Chamigo. A special made widget was created to make the opening hours under Bistro, Market, Garden, and Contact, easily editable from the WordPress admin. To support both English and Swedish the WordPress qTranslate plugin was used. To make it work with the opening hours widget, custom made sidebars was made for each language and part.